This exercise is remarkable in the case of sciatic pain, and it will also target the major buttock. While lying down, bent the knees and hold the feet on the ground. While keeping the arms at the sides, with the palms downwards, draw in the heels close to the buttocks. Apply pressure on the ground with the feet. Use the palms to support your body, deeply inhale and raise the hips off the ground. Push the tailbone up toward the pubic bone. Keep the knees away from each other, stretch the lower back, and keep the head, neck and shoulders on the ground. Hold this pose for 10 to 15 seconds, breathe out and come back down. This exercise should be done 5 to 10 times. The Locust pose will stimulate the circulation of blood to the lower hips, and will strengthen the lower back. Lie on the mat with the face down, put the arms behind your body and hold the palms outwards. Hold the toes touching each other, pointing downward, but the heels should remain be apart. Touch the ground with the chin, lengthen the neck and push down the pubic bone. Deeply inhale and raise the chest, arms and legs. Keep the neck straight, put your shoulders close together and raise the knees off the ground. Now, breathe out and hold thus for 5 to 8 seconds. The back should be gently stretched. Now, again breathe in and spread the legs apart. Breathe out and bring the legs in again. Repeat this exercise five times. If you want to modify the traditional Locust pose in order to obtain better results, you should bring the body back down to the floor, keep the hands folded under the forehead and with the face down, rest for about a minute. Repeat this 5- 10 times. This pose also improves the circulation and reduces the tension and pain in the back. While sitting on the mat, place both hands by the sides, and stretch your legs. Now bend the knee of the right leg, place it outside of the left thigh and keep the right toe with the left hand. With the right hand behind the back, push the upper body toward right, while deeply inhaling. Hold for 30 to 60 seconds, repeat the exercise with the other leg. 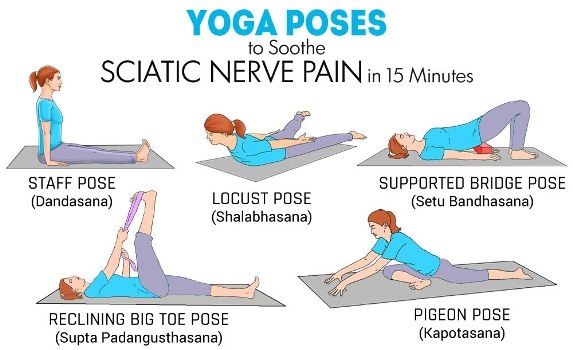 Often, something may pressure or irritate the sciatic nerve, or push it against the tendons beneath it, and it may cause sciatic pain. Raise your body in order to support on the knees and palms. Push the right knee forward so it is placed behind the right wrist, and the right foot should be in front of the left wrist. Keep the chin at a 45-degree angle at this point. Stretch the body forward while sliding the left leg backwards. Stand thus for 5 seconds, breathe in, and stretch the hands forward, in order to bring the forehead to the ground in a position for sleeping. Deeply inhale and hold in this position for 15 to 30 seconds. Push the left thigh toward the floor and push the belly slightly in order to maintain balance. Raise the head up, pull the hands back, tuck the left toes in and pull the right leg back. Repeat 5 to 10 times, with both legs.